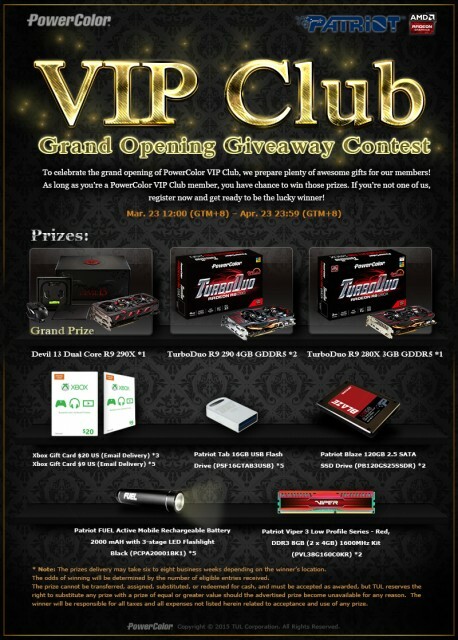 PowerColor announced the opening of their new VIP Club today, which will serve up more exclusive content, contests, product updates, free games, and more to owners of PowerColor products and enthusiasts. To get the ball rolling, PowerColor is giving away several video cards including a Devil 13 Dual GPU R9-290x. Patriot Memory is helping out and providing a few giveaway items too. For more information and to enter the contest, click the image below! You can also become a member of the VIP Club by visiting THIS LINK.